Max does not want to be a troubadour. Nope. Not at all. Instead, Max is stuck in an apprentice role to his fun-loving and quirky Uncle Budrick, the true troubadour of the family. He may not be the best troubadour but at least Uncle Budrick tries. One day, however, when the familial duo travel toward the Kingdom of Byjovia (where Uncle Budrick grew up) they are suddenly robbed by a no-good scoundrel. But don’t worry, Max takes care of that scoundrel and even steals his dagger, an impressive feat for a young kid who doesn’t want to be a troubadour at all. Max wants to be what every little boy dreams of being, an adventurous knight. 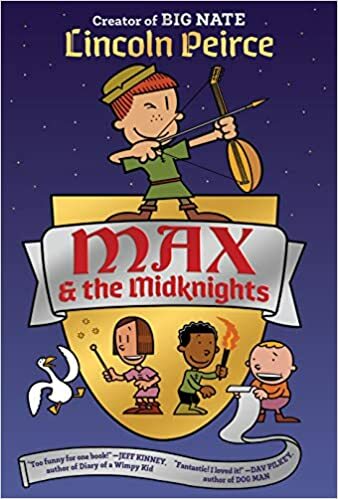 Without giving away any spoilers, which is making my fingers tingle with excitement as I type, I recommend every teacher and librarian get a copy of Max and the Midnights right away. Note: You’ll probably want to order more than one copy. No spoilers. Plot: Max is stuck in an apprentice role to Uncle Budrick. There’s only one problem with that: Max doesn’t want to be a troubadour like Uncle Budrick. Max wants to be a knight. Will Max ever be able to reach the goal of knighthood as an apprentice to his eccentric, troubadour uncle? With students, review the vocabulary words below. Ask students to read Max and the Midknights and look for each vocabulary word. When they find each vocabulary word students need to write down the following information: page number, context clues for how it is used in the story (what does it mean? ), and an accompanying image.